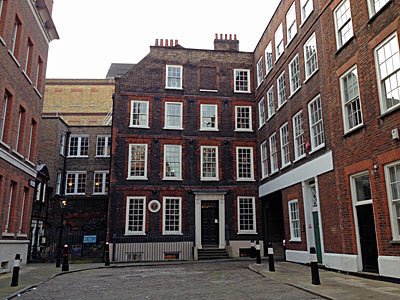 Samuel Johnson moved into 17 Gough Square in 1749, and rented the place for the next ten years. It was here that he compiled his famous dictionary, which took almost as long, and before he became the toast of London society. The building survives only thanks to the forethought of Cecil Harmsworth, a Liberal MP, who rescued the dilapidated tenement from squalor, restored it and opened it to the public in 1914. A tiny cottage was built nextdoor for the Curator, reputedly the smallest residence in the City of London, and is still occupied (if the hand I saw scrubbing the front windowsill is anything to go by). More by accident than design, the house sits in dominant position at the head of the square, beside a low arch providing vehicular access. At the other end of the square is a bronze statue of Hodge, Johnson's cat, although he never lived here, he was a feline companion from a later residence. Access to number 17 is up the side steps where you ring the bell and wait, which is a nice touch, or a very practical one to keep the heat in. Immediately inside the door is a small but well-stocked giftshop, to which access is free, but to venture any further will cost. Pay up, there's plenty to see. The hallway features a huge chain across the back of the door which Johnson reputedly used to keep his creditors out, what with him not being flushed with money at the time. In the next room is a portrait and potted history of Samuel's Jamaican manservant, Francis Barber, to whom he was (for the time) uncharacteristically kind. Various bits of West Midlands memorabilia are on display too, because a man is allowed to be tired of Lichfield, but still very fond. What's great about the house is that every room in the house is accessible, apart from certain staff-only boltholes in the cellar. 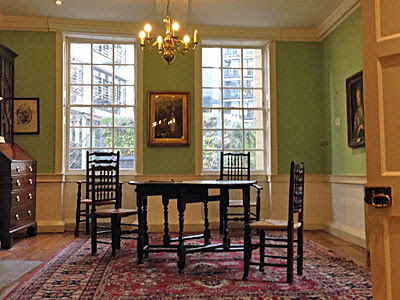 The first floor is run through as one complete room, which looks good, with various portraits and pictures on the wall, plus a wooden trunk that once belonged to the actor David Garrick. He'd been one of Samuel Johnson's pupils up in Lichfield and the two had travelled down to London to make their fortunes, which in this particular fairytale actually happened. Head upstairs again to view Johnson's will, framed, and a library with a whole shelf of Dr-J-related books that visitors are allowed to take out and read. Lending Samuel a book was unwise, apparently, because he used to scrawl his own notes all over the margins no matter how great their value. And up again to the garret, this burnt out during the war but since restored, where a two volume dictionary is open for your perusal. I immediately did what you're not supposed to do, and was disappointed (I can confirm that his original list of definitions jumps straight from Peninsula to Penitence). And I was also particularly intrigued by the view out of the window. From the front of the house is Gough Square, if not original then at least sympathetically authentic throughout. And from the side window is New Street Square, another of those monolithic glass and steel office developments to be found across most of this part of the City. 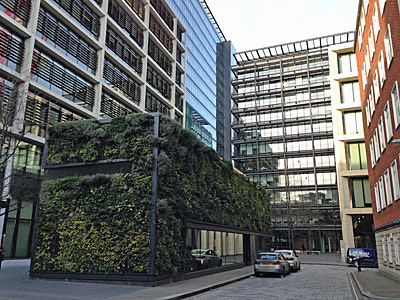 Deloitte occupy much of the accommodation, and Land Securities the squat green-roofed building closest by, but you'd not drop by deliberately otherwise. Thank goodness then for little treasures like Doctor Johnson's House, a jewel of calm in a sea of the bland.